I have a friend with a chilli pepper addiction. Red, green, big, small – she crunches on them like apples, whole, and eats at least three every day. If not, she gets withdrawal symptoms. It’s a badass party trick, but the one thing I keep wondering about is how she still has any stomach lining left. Turns out I’ve been making assumptions based on a misconception about capsaicin, the active ingredient in all hot peppers. Just like Szechuan pepper contains molecules that cause sensations in the mouth, capsaicin creates the burning feeling via a chemical interaction. When the human body detects pain due to a tissue injury, part of the signalling system includes the release of a neuropeptide called ‘substance P’. When capsaicin touches the tongue, it activates certain pain- and heat-sensing neurons that in turn release this substance. Hence one gets a feeling of burning and pain. Still, the substance P depletion is only part of the story. People like my strange friend, who scoff down hot chillies for fun are to some degree desensitized to the heat, albeit not entirely. So it may be that they have learned to enjoy not only the burn, and the soothing endorphin rush that follows, but also the pepper flavour that’s probably hidden somewhere behind all that pain. Maybe you can research how this conclusion relates to the fact that you can have intestinal bleeding from eating too much strong chili? Not saying article isn’t true (hope it is), but I was just wondering, since this can happen. Are you sure about it being caused by capsaicin and not some other substance in spicy food? Is it related to a pre-existing condition, like hemorroids? ah damn it, understood now. 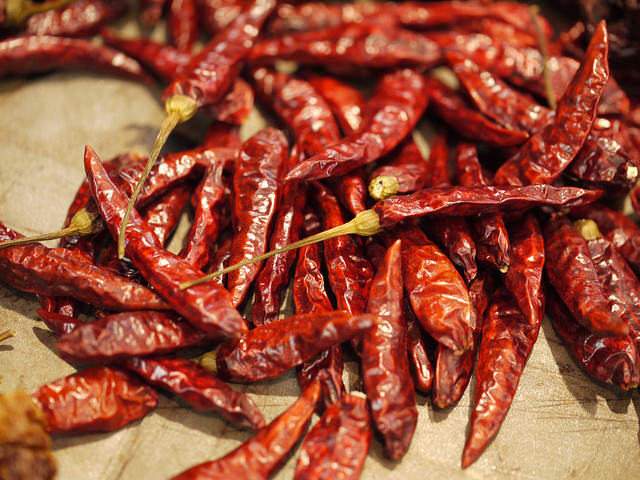 chinese have more ulcers, even though they eat less chili. Yup :) Even if the Chinese don’t ingest more ibuprofen, it could be that there is a higher prevalence of the H. pylori bacterium; and, as some studies suggest, chillies might even be protecting people from ulcers.